I started mountain biking in 2004 when I began working at a large local bike shop and needed to know what this sport was all about, especially since I was hired to sell bikes. 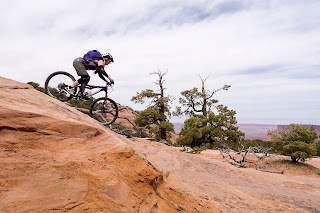 The experience I had from being taken out to Dakota Ridge (one of the more technical trails in our area) for my first mtn bike ride ever (by male co-workers) was in part what convinced me that what was needed was a women's only club. Our race team evolved a few years later. Before mountain biking, I rode BMX and loved hanging w/the boys and challenging myself. I suppose it was a natural transgression to adoring the sport of mountain biking and challenging myself! I love the technical stuff. I love flying downhill! I'm not so keen about the climb but do it for the reward of downhill. I love to encourage women to overcome their fears and to just TRY something they may have thought was over their heads -- and to not be afraid of getting off your bike and walking something that is just too much for your brain to handle. For me, it's all about the FUN! It's all about a challenge, the camaraderie, and the support that women give each other. As a child. I remember my very first bike when I was a tiny 6 year old. I was smaller than most my age and my father went to a department store that sold bikes. It was a powder blue, 3 speed bike that was 10 times too big for me. Even with the seat set as low as it would go, I had to stand at all times to pedal. It gave me wings! I think that initially it was the feeling of being free. Of being able to go wherever the bike would take me. I am naturally competitive and as I got older, I was determined to do whatever the “boys” said I couldn’t do. Then, after a series of life set-backs and an a accident that left me all but dead, I am back to enjoying riding just for the sake of being outside, enjoying the people around me, the laughter, the joy and the total sense of feeling free again, like I have wings! I will not compete. Since I am quite the competitive person I have learned that I am so competitive that I put too much pressure on myself to succeed and no longer enjoy riding. However, I do have certain people that I love to ride with and with whom I will race mostly in a long downhill or enduro type of trail that is only for the fun of riding fast and seeing who can get to the bottom first. It’s quite a different thing than competing in an actual race and I absolutely LOVE this type of competition! It hones my abilities and my technical skills. It keeps me on my toes. Excited! And, scared! I was riding with the boys at the shop and it was my very first ride on a full suspension bike and on a real ‘mountain bike’ trail. I was concerned that I wouldn’t be able to keep up with them. I had no clue what I was getting myself into. And they, for their part, took me to one of the hardest, most technical trails we have – in the snow. My excitement turned to astonishment (wow! People ride these types of trails??!!) My astonishment turned into determination. I endoed. I slid out. I had NO mountain bike handling skills. I could pedal a bike because I had basically been riding some road up until I was introduced to the sport of mountain biking. It literally changed my life! Weirdly, I don’t think I had any real ‘nervousness’ at the beginning. Later, I had performance nerves – especially after I realized how FIT everyone who mountain biked was. And they all seemed to have mad skills, too. And then there was me. No skills, no mountain bike fitness. I was definitely intimidated. It wasn’t until I began discussing this with different folks that I realized that a LOT of women/girls feel exactly this way. That weighed in on my thoughts that a group/club for women with mentoring, positive reinforcement, laughter, skill development, and no demands but to have fun was needed. And, I then realized that if I wanted that, someone was going to have to organize it. The rest is history. I started out mtn biking with clipless pedals. I crashed a lot with clipless pedals and it initially created a fear of mountain biking that needed to be overcome. After talking with a friend of mine who was heavily into DH who recommended trying flat pedals because of the ability to “dab” through tough sections or to bail when needed, I tried them out a few years ago. I have not looked back. There is a learning curve when changing from clipless to flats. Your pedal stroke depends on you ‘scooping’ the pedal up rather than pulling up and going to flat pedals actually promotes proper technique on the bike and better bike handling skills. I encourage ALL beginners to ride on flat pedals. If they become involved in XC racing, then think about clipless. However, the testing that has been going on since the clipless vs flats debate started has shown that there is not a significant speed/performance difference between the two. I believe that is because those who go flat use technique and those who go clipless “cheat” and use their pedals for advantage. I had a life-altering accident about 4 years ago. I had a mechanical while doing a super fast downhill section on a local trail. I had a Talas Fork and it collapsed throwing me off the bike. So, I have had to overcome the challenge on all levels of getting back into mountain biking. The FEAR was almost overwhelming once I got back on the bike. And, my fitness level has never quite returned. I’m ok with that now, but it has taken a bit for me to accept that I may never be of the same caliber rider as what I once was. I am quite thankful for the support I received from club members mostly (and my skills instructor) who so embraced what & who we are as Dirt Divas, that they literally brought me back to a point of being ok with myself! I learned to be kind to myself, to accept my limitations, to walk a troubling section when I needed to and I’m still working on the aspect of “apologizing” so much for not being who I used to be. Apparently, I had an innate ability with bike handling skills from what I am told. I presume it’s because I rode a lot of BMX as a kid. However, I took a clinic soon after starting the Dirt Divas and was amazed at how much better and easier mountain biking became. I absolutely feel that everyone should invest in taking (and retaking as refreshers) skills courses. There are some really good ones out there and you have your choice of doing long weekend courses or shorter ones (like we offer) that will concentrate on specific skills. I don’t have enough bikes, first off. My current mountain bike of choice is the Pivot Mach 5.7 carbon with a 26er wheel. I absolutely adore this bike – it does everything well. Everything. Kona WO fat bike – for having fun in the snow. Basic. Heavy. Fun. Felt Road bike – All carbon, Ultegra components for hitting the road. Perfect for me and the road. Schwinn road bike – Old school. Converted into a flat bar commuter bike with fenders. I think all women as they get into mountain biking should invest in a good set of lightweight, good fitting protective pads. It helps to alleviate the fear of falling and hurting something. I have used G-Forms recently, but am switching to the Alpine Stars because they are better made, fit better and have a better price point. A really good pair of riding shorts with an excellent and well-fitting chamois – makes the difference between a great ride or a crappy ride. My 5Ten shoes and SMAC flat pedals. And, most of all, my Reverb seat dropper!